This is the quilt that is on my design wall this morning. The blocks are from the first Dear Jane Christmas Signature Swap in 2008. I worked with the color arrangement of the blocks off and on for a month of more, and I finally sewed them together and put the borders on. The red and green hourglass block border is made from blocks that I had planned to use as alternate blocks. I decided against that setting and then decided to use the blocks for an inside border. The outside border is another story. I have bordered a few quilts over the last few years. I know the proper way to cut borders for a quilt is to measure both directions through the middle of the quilt. On Friday I cut mitered borders and sewed them on the quilt. I couldn't remember exactly how to do that so I did it from memory and just made it up as I went along. When I brought it downstairs to lay it out I swear those borders were waving at me. So yesterday I took those mitered borders off and reworked them using four of the leftover signature blocks in the corners. Here are a few close ups of the blocks. I know some of the blocks in this quilt were made by blog friends. I've posted over at my other blog about this pattern that I'm working on for the Super Scarves project to donate a scarf to each of the 8,000 volunteers that will be helping out with the Superbowl when we host it here in Indianapolis in 2012. And, I've been given the Love Blog award by Brenda Kay over at http://crazyquiltingmom.blogspot.com/. I'd like to give the award to all of the people that I have listed in my favorites on my side bar. I get so much inspiration from all of these blogs. I hope you all find some time to do some stitching today. Thanks for visiting! One Flower Wednesday....in the snow! Today is One Flower Wednesday over at Journey of a Quilter blog. Up until a couple of weeks ago, I thought One Flower Wednesday was something that just sounded good when you said it. One night I was reading blogs, and I happened onto this blog where you can go and sign in if you have made hexagon flowers. Here are the three flowers that I made today. I really prefer to take photos outside just because they always look brighter and better overall than the ones I take inside. We've had snow on the ground here for what seems like forever, so I put on my winter coat and waded out back and took my photos on the deck. This is the second photo that I took. Below is the first photo that I took. I just tossed the hexagons down onto the snow and took the photo. After I got back inside and warmed up, I downloaded the photos to my computer. They looked like they were taken on a white table except for the little bit of snow you can see on the orange flower. So...... I put the winter coat back on and went outside to take more photos. Here's a photo of the woods out back with snow on the ground. I never get tired of looking out there, and I really enjoy walking around in the snow and listening to the crunching under foot. The woods are always so quiet and peaceful after a snow. My niece, Angela, is learning to quilt. She has just finished her first quilt top and is getting ready to machine quilt it. She came down to visit over the weekend, and brought me this pillow that she made. I love the white trim around the outside that looks like tiny snowballs. Since it has a snowman on it, I'm going to keep it out to enjoy it for awhile. I hope you are all finding some time to do some stitching today!!! Thanks for stopping by for a visit. It's scrappy Saturday over at So Scrappy blog. Angela is hosting the Rainbow Scrap Challenge where she designates a color or theme for every month along with ideas, and we pull our scraps in that color and make something. This month's color is blue. The goal is to use more scraps by focusing on a single color each month. You can work on a series of small projects, a large one, or create individual blocks to go together into a single quilt at the end of the year. I plan to make this quilt a bit larger and then use some of my leftover 1 1/2" strips to make blocks of some sort to put into a quilt at the end of the challenge. Since I have been working on the Roll Roll Cotton Boll mystery, I can't get enough of these string blocks. They really kind of grow on you. If you look at the photo below, the block with the bright fabrics on the left is how I normally make my string blocks. If you look under my banner, I have a tutorial on how I make these string blocks. I draw a diagonal line on a foundation so that I can center that black contrasting strip so that it creates a secondary design in the quilt. For the string blocks in the quilt above, I did something different. I made my string blocks by sewing the strips straight up and down on the foundation as shown in the photo on the right. For my foundation I use paper from this Scribble Pad that I bought at the dollar store for $1. A foundation isn't really necessary, but if I'm watching TV or a movie, it gives me some sort of guideline to shoot for because if I'm distracted it is hard to judge what 9 inches really is. An old telephone book would also work as a foundation, although I don't know how much longer we will be getting paper phone books. After I've sewn my strips to the foundation, I place them right sides together with the strips running the same direction. I then draw a diagonal line from corner to corner on the foundation paper. I drew dashed lines to show you where to sew, but you don't need to do that on your blocks. Sew a quarter inch on both sides of the drawn line. Then cut on the solid line. You end up with two blocks that have strips that chevron. You can either arrange the blocks with the chevron all in the same direction like the left photo, or you can turn part of the blocks upside down to create a different look like I did in the right photo. I hope that you are finding some time to stitch this evening. Thanks for visiting! 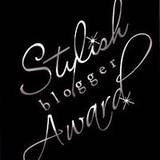 I've received The Stylish Blogger Award from Staci over at The Confused Quilter. Thanks Staci!! When I think of stylish, I think of a cross between Martha Stewart, Queen Elizabeth and Julia Roberts. So I'm not sure that stylish is the right word, but I'll take it just the same. There are a two rules for this award; one is that I have to share 8 things about myself, and the second is to pass the award on to 8 other blogs. 1. I am an only child. I am really envious of those of you that have siblings, particularly those of you that are quilters and have sisters that also quilt. I would even settle for a brother that would appreciate one of my quilts, but it wasn't meant to be. When my parents both had passed away, I somehow had the feeling of being an orphan. I know that's probably silly, but I think it was just that there was no more home to go to. 2. I went on my first date with my husband on January 18, 1973, and we were married May 19, 1973. That was a short courtship by most people's standards, but it was right. We will be married 38 years this coming May. 3. I have two grown children; both of them are amazing people. My son composes music, and is music minister at their church. He also works part time in an elementary school media center. My daughter has a degree in Mechanical Engineering and Math. She worked in Alabama for 2 years, and now she is at Purdue getting her Master's Degree in Statistics. She played with the Purdue handbells last semester. Both of my children are musically inclined, and their Dad and I can barely play the radio. 4. I taught ESL (English as a Second Language). That was an interesting job. People ask me how many languages I know. I know just enough Spanish to ask for a drink of water and for directions to the restroom. Well, ok, I know a little more than that. I love it when my Spanish speaking blog readers leave me a comment or send me an email totally in Spanish. I do my best to figure out what it says before I cut and paste it into Google Translator. 5. I've quilted for 16 years or so. Before that I made a few hexagons, but had no idea what fun it would be to learn so many different quilting techniques and just how many good friends I would make along the way. 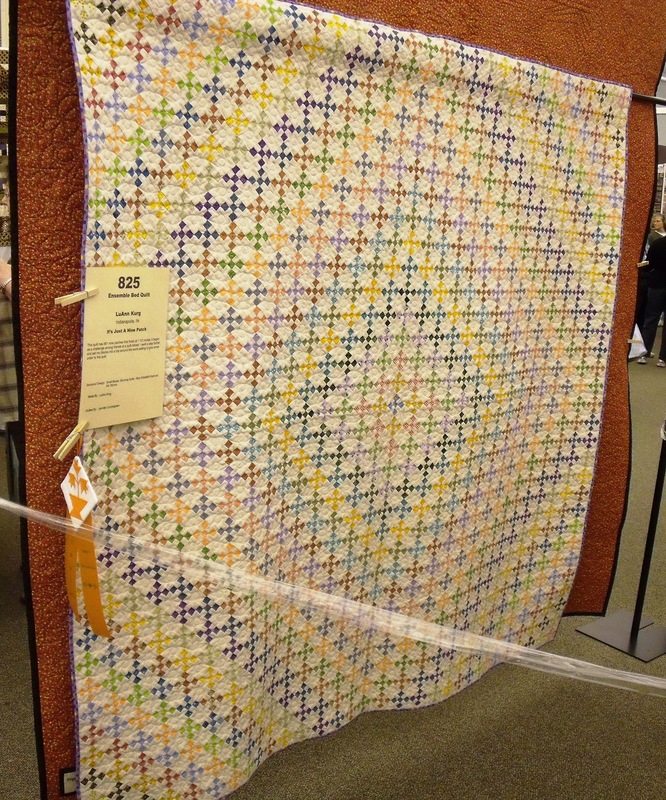 Last spring I entered a couple of my quilts in the Indiana Heritage Quilt Show held in Bloomington, Indiana. I was awarded a ribbon for Judge's Recognition. I had never entered anything in any quilt show before-not even a guild show-so getting the ribbon was quite a thrill. 6. I am equally as addicted to knitting and crocheting and collecting beautiful yarns as I am to quilting and collecting fabric. You will hardly ever find me just sitting somewhere. I am always working on some applique', redwork, knitting or crocheting. 7. I had a total knee replacement in June 2009. I spent a lot of time working with a physical therapist, exercising and strengthening that knee both before and after surgery, but I'm pain free and if I had to I'd do it all over again. That was one of the best decisions I've ever made, and it has definitely changed my life. 8. I love technology. I almost didn't get a convection oven because I thought I wouldn't be able to figure out how to cook with it. Boy was I wrong about that. I love this new Droid phone, and I'm finding out new things about it every day. But, if you are still reading my deep, dark secret is that I love video games (and some computer games). When the Wii was just coming on the scene, I had sold a bunch of collectibles on EBay. I took part of that money and stood in line at Fry's Electronics before they opened one morning when I knew the new shipment was coming in so I could buy a Wii. I claim that I got it for the Wii Fit so I could exercise....oh really? I got it to play Mario Kart, and I love Guitar Hero. I even have 2 guitars in case anyone comes over and wants to play. If only I could play games and quilt at the same time. 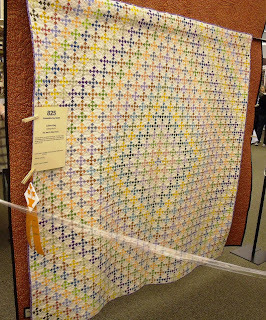 Here is a photo of my quilt that received the ribbon. It's called It's Just A Nine Patch. The nine patches are 1 1/2" finished and there are 964 in the quilt. There are so many great blogs out there that it is really hard to pick just 8. One of my favorite things to do while blog surfing is to go to a new to me blog of someone who has left a comment on one of my regular blogs. I just love seeing what everyone is working on and what fabrics they are buying. And of course go on over and visit Staci the Confused Quilter that gave me this award. I reallly appreciate all of my followers and those of you that leave comments. I try and get around to visit all of you if there is a link back to you, and I try to respond to your comments unless you are a no reply blogger. It's snowing here today so I'm heading off to do some stitching. Hope you are doing the same! Life is just a bowl of hexagons! These are 1" hexagons that I've started. I guess these count as another UFO. I love the bright colors even though I'm not sure what the plan is for them right now. There aren't equal numbers of any of these so I think they will end up as flowers with solid(-ish) centers. The fabrics I had for this project were just perfect for fussy cutting. It takes more time, but I think it is worth the extra effort. I think this one looks like a flower. I love the colors in this one. This one is probably my favorite so far. I think this part of the project stalled because I didn't like 3 solid (or solid-ish...is that a word?) fabrics in a row. So I will probably take it apart and come up with a different idea. I love hexagons, and they are really portable. I have some packed to take with me tomorrow. I'll tell you about that next time. Thanks for visiting, and I hope you are finding some time to stitch today. Today I spent some time watching it snow and stitching hexagons. I love hexagons. I think that love came from my Grandmother because that was the only type of quilt she made. Her quilts were made from whatever cloth she could find. Many of her quilt blocks were made from her housedresses that had seen their best days. Then as a young girl my Mom, one of our neighbors, and me all started buying yards of fabric and sharing so we each had 1/3 to make hexagons. It just occured to me....maybe this stash building is hereditary. Yes, that's it!!! While blog surfing awhile back, I went over to Texas Freckles blog and found that she is having a Hexagon Charm Quilt Along. So I signed up. I have my little travel bag with all of my hexagon paper pieces and a few squares of fabric so I have a take along project all ready when I go somewhere. We've had a couple of measurable snows this week. Here is the view from my back window. OK. I'll admit it. I put on my boots and trekked out through the snow into the yard. I just couldn't resist. The snow was so pretty. A few weeks ago we had yellow Christmas lights on the ornamental grass out back in the flower bed, and it just sparkled. Now the snow has weighed it down. We usually don't cut our grasses back until spring because they are pretty in the winter and provide something interesting to look at outside besides the bare trees. Happy stitching to all of you!! Thanks for visiting. I grew up in a house where we always watched basketball and baseball. At one point in time I could name all of the coaches of the NCAA Big 10 teams and the centers on each team. I was at Riverfront Stadium the last time that Pete Rose took the field to play with the Cincinnati Reds. So being interested in football is something that is new to me in the last several years. There is a lot of talk about the Indianapolis Colts on the radio and TV here, and you see a lot of blue Colts jerseys on people all over town on blue Fridays (the city designates the Friday before a home game as blue Friday to wear Colts gear around in support of the team). Indianapolis has won a bid to host the Superbowl in 2012. I'm not sure how this all got started, but someone here in town decided that it would be a neat idea if those of us here in town that knit would make a blue and white knit scarf for each of the volunteers that will be helping out with the event. I seem to remember the number being 1,100 volunteers. Of course I signed on to be a part of the project. Mass Ave Knit Shop downtown held a free session to give us this football pattern and teach us how to do intarsia knitting. The pattern is designed to use up all of the blue and the white yarns so the opposite end of the scarf will be the inverse of what you see in the photo. After I'm finished knitting, there are cross stitches that I'll put on top so it looks more like a real football. This is my progress so far. Here is the chart for the pattern. Susan that owns Mass Ave Knits designed the football for us. On the reverse side she designed a Colts Horseshoe, but the NFL didn't want anything on the scarves to be team specific since we have no way of knowing who will be in the Superbowl in 2012. But, she gave us the horseshoe pattern for our own personal use. My daughter shrunk the design down and knit this little tiny ornament sized stocking for our tree. The Colts playoff game against the NY Jets is tonight at 8, so we will call the pizza man and have him deliver some pizza and breadsticks, and we'll be watching the game. I always "watch" TV with some sort of sewing, knitting, or crochet in my hands because I always like to be doing something. I hope you are finding some time to stitch or do something crafty today. There hasn't been a lot of machine sewing going on here, but I've made a little progress on the Roll Roll Cotton Boll mystery posted over at Quiltville. I've done a little hand sewing on my Christmas Hearts tablecloth redwork blocks, and I've stitched a few hexagons. I have my Hearts and Flowers applique' quilt by Kim McLean out to try and finish the center on that so I can move on to the borders. This is step 1 of the mystery. For the first step we either looked through our scraps or cut from our stash to make 172 of these units. The next Friday we made 120 pink and brown half square triangle units. Then comes my favorite step. We were to dig into our scraps and pull out anything that was neutral or mostly neutral. I had some real "dogs" that I couldn't figure out what to do with, and they went into these 60 string blocks. Here are some of the finished string blocks. These blocks really sew up quickly if you just spend 10 or 15 minutes a day at the machine. You will find a link to my String Block Tutorial underneath my header. Week 4 was relatively quick and easy compared to all of those string blocks, so I skipped ahead and completed that one while still sewing the strings. OK. I was caught up by the time that clue 5 was to be released. And, then came step 5....600 red/neutral half square triangles. So far I have 18 of the 600 finished, so it will be awhile before those are all done. Step 6 uses these red/neutral half square triangles and the units from step 1 with brown triangles so there are no photos because I was busy with the holidays. Then things slowed down, and step 7 was posted, and the center of the quilt was revealed. This is part of block 1 of the quilt center. Maybe you could guess that those red/neutral half square triangles go around the outside of it. So this is just a partial block, but I like the colors and couldn't wait to sew just one. Then we did some more cutting of the string blocks, rearranged the pieces and sewed them back together to make this block. The next clue will be posted in the morning, and I plan to keep at this project until I get the top finished so that it doesn't become another UFO. Speaking of UFOs, I took a photo of part of my UFOs but couldn't get up the courage to post a photo yet. I need to dig through sort and organize them first in hopes that it really might not be as bad as it looks. We had warm blueberry muffins tonight to help pep up our leftovers. We had a light dusting of snow this afternoon, and it seemed like the kind of weather to do a bit of baking. Hope you are all finding some time to do a little stitching today!!!! Since it's the beginning of a new year, I decided to make some changes to my blog. I think my other banner might have been original to my blog. This one has projects that I have either completed or have in progress. Let me know what you think of the new look. These are the crafty books that I got for Christmas. The first two books came from my daughter and the last one is from my son and DIL. I have wanted the Sock Yarn One Skein Wonders book since it was released a couple of months ago. It has a lot of great projects, and is a good way to use up some of the sock yarn that I have in my yarn stash. The Crochet Motifs book has a lot of great designs for using leftover yarn in lots of different shapes. I'm kind of partial to the hexagons in the book. I've made a couple of hexagons just to try out one of the patterns. The yarn really looks better than in the photos, but I think I may need to get some brighter yarn for the real project. I love the applique' in this Rose of Sharon block book. The blocks in this book are from an on-line EQ6 challenge The challenge was to design a Rose of Sharon block using only three shapes in limited sizes. If you have EQ6, you can go to the electric quilt web site and download the shapes to design your own blocks. I think some of these blocks would be pretty in red and green. I hope that 2011 is a happy healthy year with lots of sewing and stitching time for all. Happy New Year to you.